Charles Demuth sets out to capture what makes America Great only to paint smoke belching out of factories. Following the end of the first World War, the artistic center of the West shifted from Paris to New York City as America became the pre-eminent economic powerhouse on the world stage. American artists like Demuth and his contemporaries Alfred Stieglitz and Georgia O’keefe sought to elevate American art by portraying distinctly American subject matter in a uniquely American way. And nothing symbolized America more than industry, which was rapidly changing the very fabric of life. Imagine how mind-boggling life must have been in 1921. Airplanes. Assembly lines. Automobiles. Cinema. Skyscrapers. Enormous dams. The very first robots. The future itself was being invented! It’s like when scientists today produce cloaking devices and it feels like we’ve stepped onto the U.S.S. Enterprise D. Only to the Victorian dinosaurs still roaming the Earth in the 1920s, it probably felt more like a Jules Verne novel come to life. It’s only natural artists wanted to make art out of the new technological instruments of American power and ambition. 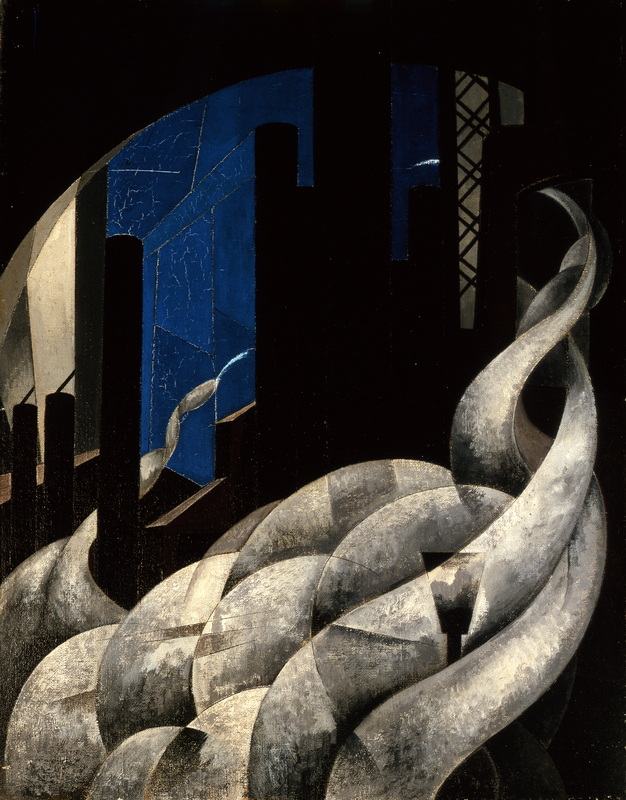 For Georgia O’Keeffe, as can be seen in her painting Radiator Building--Night, New York, the new American paradigm of industrial romance lay in the New York City skyscraper. Charles Demuth found his inspiration in less glamorous locales. To him, the essence of America lay in the smokestacks and water towers that were altering the landscape closer to his home in Lancaster, Pennsylvania. He could’ve chosen, I don’t know, the newly formed National Parks to be emblematic of his country, but NOOOOO. Had to go the smokestack route, didn’t he? Here he takes as his subject matter the Lukens steel yards in Coatesville, not far from Lancaster. A dramatic departure from his earlier works, which were vague watercolor washes depicting flowers or circus acts, his new, industrial subject matter was accompanied by a drastic shift in style. Inspired by the cubism of Cezanne and the machine-made sleekness of works by his buddy Duchamp, Demuth was the first to develop what would later become known as precisionism, a style characterized by simplified compositions reduced to crisp lines and overlapping shapes. Devoid of visible brushwork, precisionism reflects the automation of labor used to create the very industrial objects the movement sought to depict, which is precisely what we see in Incense of a New Church. The question remains as to whether or not Demuth’s comment on the religious devotion to science and industry was satirical, critical, or merely symbolic. Demuth grew up a good old-fashioned Lutheran boy, but he didn’t stay one, so it’s unlikely he was being downright disapproving of this “idolatry." Is it possible he found the strange new texture of his world, full of factories where there were once farms, repulsive? One of his friends, Rita Wellman, once wrote that Demuth “prefer[ed] the wooden and plush era to the modern metal and leather one,” which might very well indicate a certain nostalgia. But it’s possible that this painting is just a comment more than it is a judgment. By transforming the drab into the beautiful, some have even argued that he imbues his subject matter with a sense of confidence and hope, the curling smoke representing progress or a change in the wind. Progress or not, I still wouldn’t recommend inhaling that stuff too deeply. Haskell, Barbara. Charles Demuth. New York: Whitney Museum of American Art, 1987. Kellner, Bruce, ed. Letters of Charles Demuth: American Artist, 1883-1935. Philadelphia: Temple University Press, 2000.